Signs, Banners, Wraps, Trade Show Displays, and more! We are a team of professionals working together to change the way customers see your business! We bring your vision to the marketplace through signage projects and printed media. We are a full-service signs, banners, marketing and promotional products company with our own production facility where we produce signage products with 1-day service. You can count on us for eye-catching banners, signs, outdoor business signs, promotional items, and vehicle graphics such as wraps, magnetic signs, and window lettering, to promote your cause. Our goal is to promote growth in business and community, to create jobs, and to deliver a positive image and message for you to promote your business. Our goal is your success! We are deeply involved in our community and industry associations. We go the extra mile because we want to earn your repeat business. Contact us today to begin a powerful partnership. “Since first partnering with Sign-Ups and Banners for our new pole banner program in January 2017, Sue and her team have proven to be impeccable partners. They have always exceeded our expectations and provided excellent customer service. Without Sue’s partnership, our program would not be the success it is today. Check out what’s happening at Houston’s top sign company. We are accredited by the Better Business Bureau and maintain an A+ rating. We’re honored to have received the Distinction Award for Excellence in 2011/2013/2016/2017/2018, and received the prestigious Pinnacle Award in 2012, 2014 and again in 2015 for superior commitment to ethics, overall excellence, and quality in the workplace. Our goal is your success! Catch your customers’ attention with fabulous banners and signage! Quickly grab your customers’ and prospects’ attention with vibrantly designed signs and banners. From Houston signs, building signs to event banners, Sign-Ups, and Banners’ experienced team can assist you with all of your signage needs! View our extensive portfolio of signs that we can tailor to your business. Promote your business with our quality banners and boost your sales. 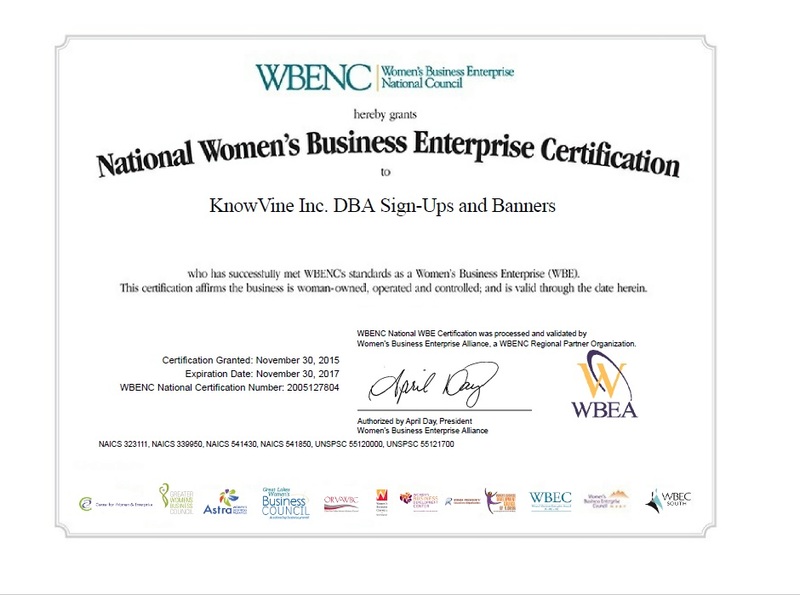 Sign-Ups and Banners create vibrant, memorable banners to attract new customers. 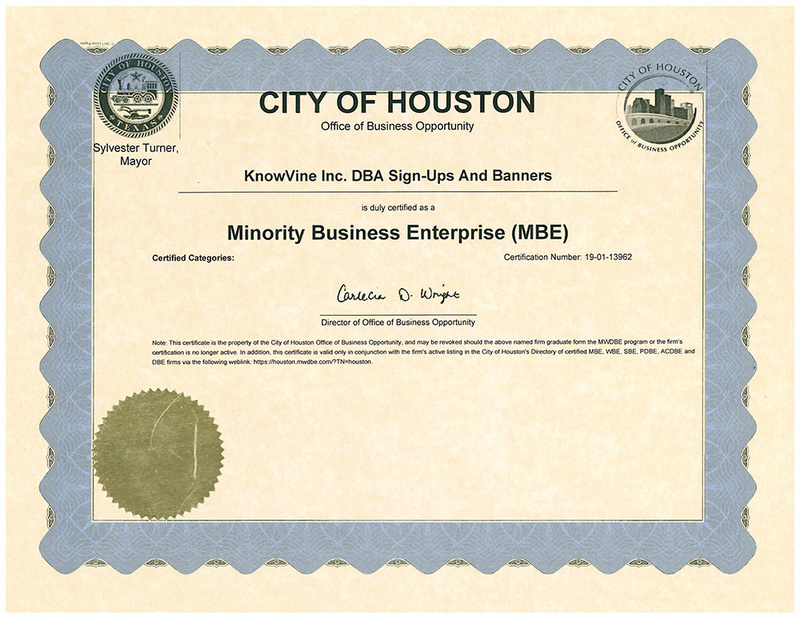 Learn more about incorporating banners into your event or business. Want to draw more attention to your business? Turn your idea or logo into a custom flag. Our colorful, attention-getting flutter, bowhead, and swoop flags are perfect to bring in traffic. From apartment communities and commercial businesses to special events and grand openings, custom flags attract more visibility. Turn your business vehicle or fleet into moving billboards! With vehicle graphics, lettering or complete vehicle wraps, your business will be seen all over town! Promote your business. Build brand awareness. Project a professional image. Whether you have a car, mini-van, pick-up or tractor-trailer, all vehicles present an inexpensive way to constantly promote your business. Have you ever thought of using your business windows as extra sign space? Window lettering is a quick and effective way to get noticed and it can be easily changed throughout the year. Use your windows to promote your business name, logo, hours, goods, and services, specials or seasonal promotions. Make the most of your window space and start promoting your business today. 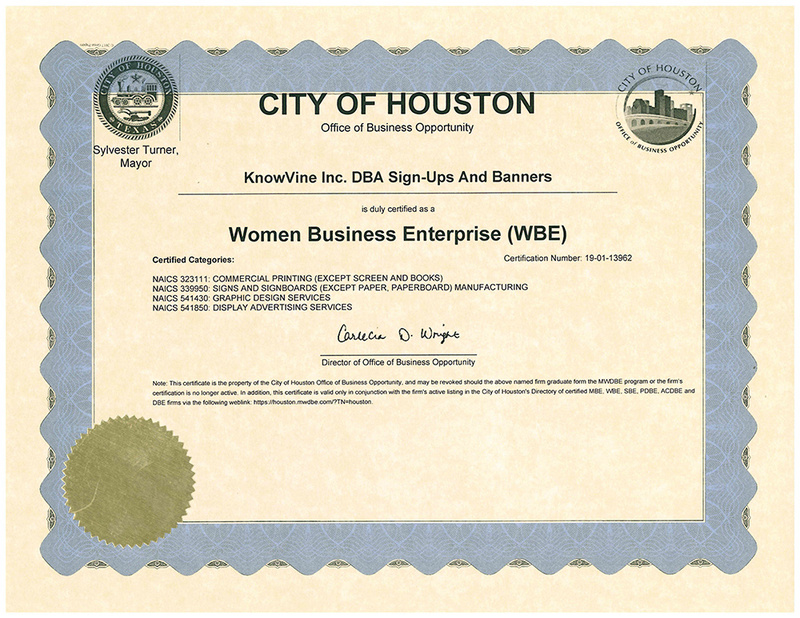 We are proud members of the Better Business Bureau, Women’s Business Enterprise Alliance, The Greater Heights Area Chamber of Commerce, Houston Apartment Association, and The American Marketing Association.